March 25-26 ,2006 Pt 1 Here’s a little story off of the beaten path. Last weekend, Vickie and I jetted off to my hometown, Bradenton, Florida (check out the writing on a carton of Tropicana Orange Juice sometime.) The event was my parent’s 50th anniversary. There was going to be a pretty big reunion of friends and family to see my folks renew their vows. This was my first time back there in over 12 years and we were going to be there for barely 2 and half days, but I couldn’t miss this for the world. But let me get to the Batman part of this story. 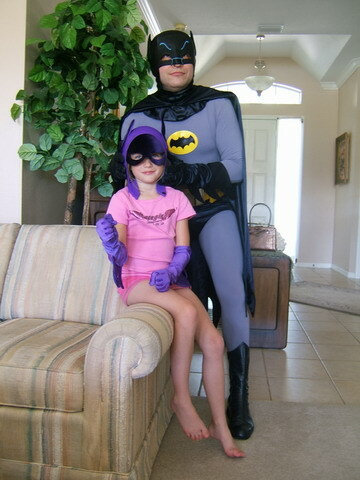 My sister’s daughter, Rachelle, is about seven and has been telling her friends and classmates for the past year that her uncle and aunt are Batman and Batgirl. Needless to say, she had been getting quite a bit of ribbing from this. My sister asked me to PLEASE bring our costumes with us and come see Rachelle and their three year old, Zach for a little bit. How could we refuse? Early Saturday morning, Vickie and I pulled ourselves out of bed feeling the three hour time zone difference and proceeded to get ourselves together. We were staying at my folk’s place and they got to see us in full costume before we took off. I told my mom to call my sister, Hope, and tell her that we were on our way. My mom talked to her and then told me that Hope ended up inviting some of Rachelle’s friends on over for autographs and stories. No pressure!! I figured that we would need to arrive at my sister’s house ready to go so we drove off in our rental car in full Bat-costume. I imagine there were more than a few turned heads at some stop lights along the way. I know I waved to a few. We didn’t even get to stop the car before Rachelle started coming out of the front door towards us. She gave me a death clamp hug. I looked around for Zach and they said that the moment they told him that Batman was coming to their house, he turned and ran for his room and wouldn’t come out. He must have seen one of the recent movies. The other kids had soon arrived and Hope showed me some pictures that she printed of Vickie and me from my web pages for us to sign. Rachelle introduced us to her friends. 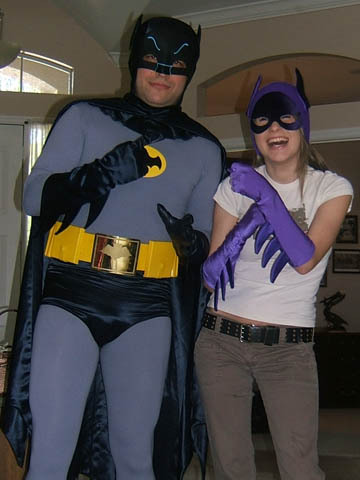 But it wasn’t “Batman” and “Batgirl”. She would point out each one of us to them and say, “Aunt…Uncle.” I think she wanted to make a point. It was a beautifully clear day so we took the group out to the patio area where there were pictures taken. 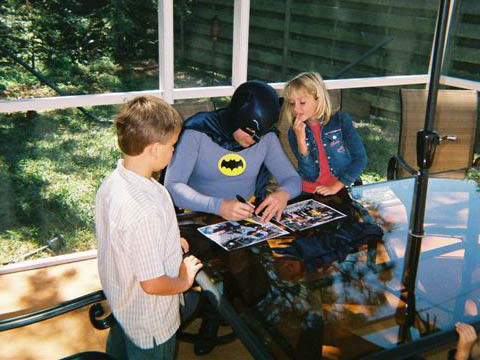 We eventually sat at a table near the pool and did our “signing.” I took off my gloves to do so and noticed them all staring intently at each glove as I laid them flatly on the table in front of me. It was fun to talk to each kid and asked them about their hobbies as I tried to sign their pictures. My brother in law, Kevin shot video of it and eventually wanted an autographed picture himself. We’re a silly family. I tried to do a little Q/A with them but most of them just kept staring at the suit, belt and such. They seemed a bit stunned. 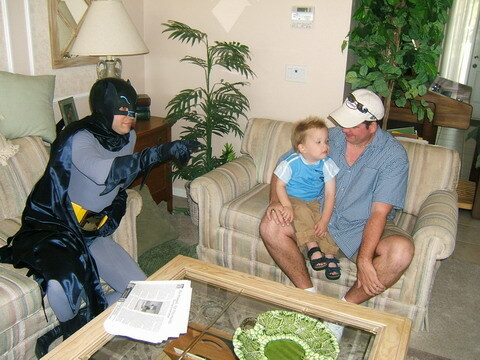 The rest of the kids started to leave and I felt like I should try and see if Zach could handle meeting Batman since he might not ever get this opportunity for a very long time. I told Kevin to stand at the front Zach’s door with it open to where Zach could see him standing outside of it. I approached Kevin and said, “Hello there Kevin. I was just coming by to say ‘Hello’ to Zach but I can’t seem to find him anywhere.” I stood at the door to where Zach could see me but I wasn’t looking in at him and continued to talk to Kevin saying that I just stopped by on a friendly visit. I them slowly turned my head a looked surprised to see Zach and I waved, “Oh…there you are. Hi, Zach.” He was sitting on his bed and gave a faint yet nervous wave but had a big smile. I stepped into his room and made mention of all the cool stuff that he had in there. I asked him if it was okay for me to sit next to him. He was clearly interested but a little overwhelmed at the same time. Kevin did manage to get a picture of the two of us sitting next to one another but I didn’t want to scare the poor guy. I waved again and said goodbye. He waved and smiled. Pt 2 Saturday night, we attended my parent’s 50th anniversary party. They retook their vows and the night was a who’s who from my childhood past. During that time my sister said that they would come by to visit Vickie and me Sunday morning before we left for the airport in Tampa. She also told me that they had put in the 1966 movie DVD after I had left. 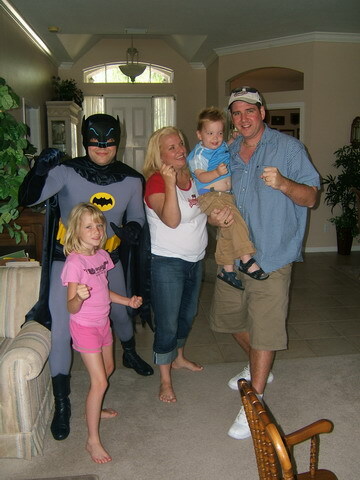 Not only did Rachelle enjoy watching it but Zach watched it as well and pointed at Batman and pointed back to his room. 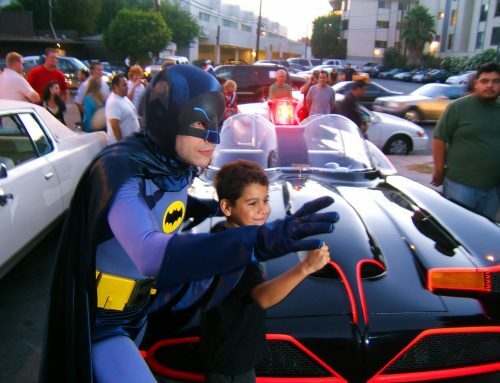 He loved watching the Batmobile, Batcycle and Bat-boat as well. 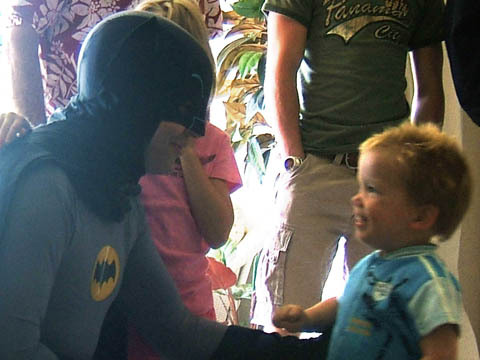 She was very happy that I had made a point a seeing him as Batman if only briefly. 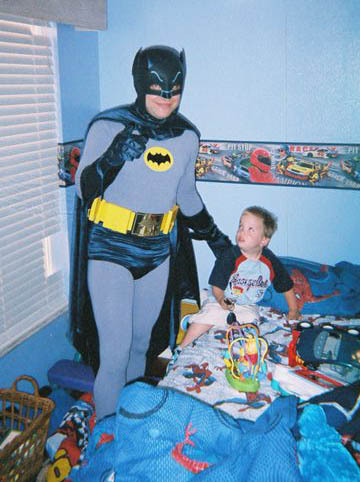 I then wished that he had seen the footage before I came over to know that I wasn’t one of those dark and brooding Batmen that he had been seeing. Sunday morning came and we packed up our things early so that we could spend as much time with my family before we absolutely had to go. My sister came by with her family. 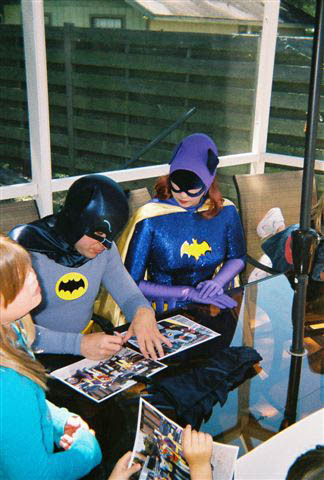 I gave her a DVD compilation of some of my Bat adventures over that past year. She quickly put the disc in my parent’s DVD player to watch it. Zach pulled up a little rocking chair straight up to the TV set to view the footage up close. He smiled and pointed at me as Batman while sitting in Nate’s Batmobile. 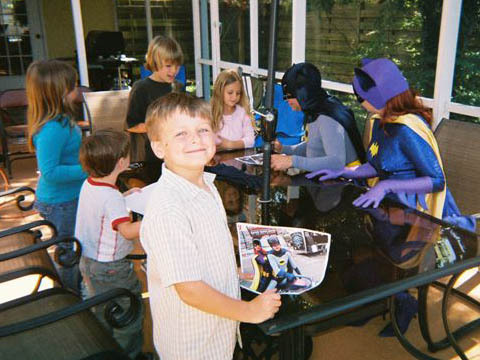 Hope said, ‘There’s Batman.” Zach turned his head and looked out the sliding glass door thinking that she meant that Batman was outside and not referring to the one he was watching. My parents even joined in on watching the footage. 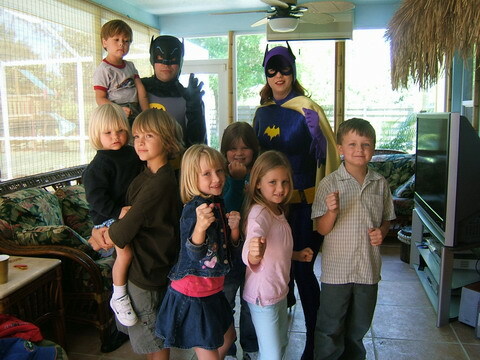 They had never really seen Vickie and I in action while in costume with kids and fans. 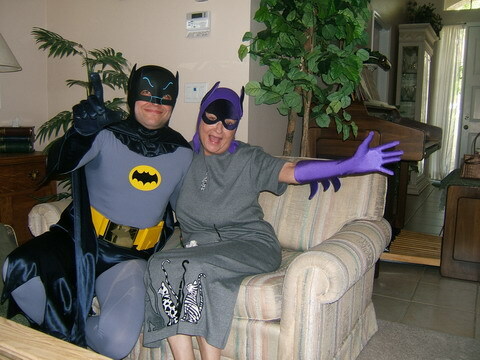 My folks were never really ones who went for fantasy or costuming. 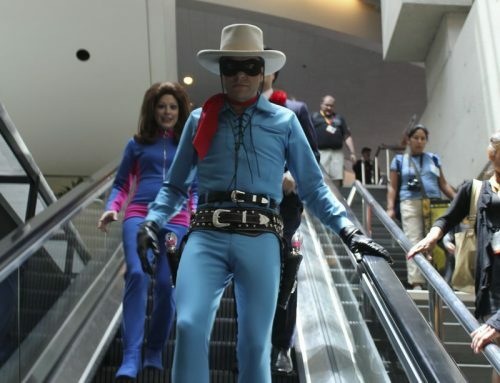 I never saw either of them in a costume all my life, so it was nice to see them take an interest in our adventures as costumed do gooders. My brother Joel arrived and Zach was now watching “Blue’s Clues” by the time he had shown up. I was sitting quietly on the couch while everybody else talked about the night before, kids, and everything else under the sun. Hope started telling Joel about Zach’s reaction to Batman the day before. As soon as Zach heard Batman, he turned his head again to look outside. I knew what I needed to do. I looked up at the clock to see how much time I might have. I took a quick assessment of the house’s layout and available exits for me. I casually got up and went back to the room where I was staying in. Everyone else was so engaged in conversation or eating some breakfast that I went pretty much unnoticed. Perfect. I unpacked my suit and made fairly quick change into Batman. I guess practice makes perfect. The guest room was adjacent to the garage entrance of the house and out of sight to those in the living room. I went out of the garage and around to the backyard where the sliding glass door was so that Zach might get a view of me outside. I made a slight miscalculation in that Kevin was in the backyard playing with the kids already. I came around the corner and came into direct view of the kids. Rachelle ran up to me and put a death grip around my leg. Zach put a different kind death grip around his father’s leg. 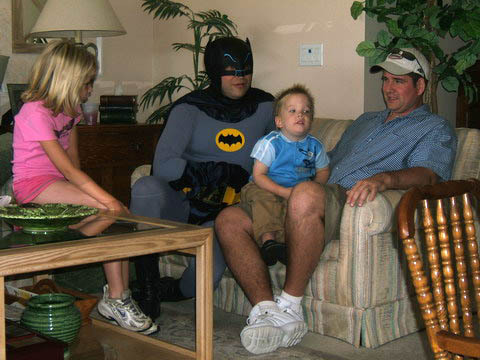 I guess Batman seems a lot less intimidating on a television set. I could hear the rest of my family hooting and hollering in surprise from inside the house. Rachelle and I walked into the house together with Kevin carrying Zach in tow. 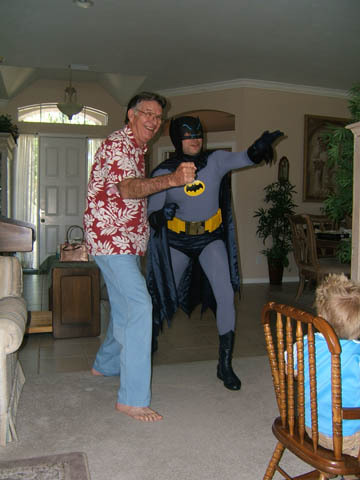 My brother Joel had never seen me as Batman or any of the video footage. He was old enough to clearly remember the show when it first aired. He was floored when I started talking to him as Adam and doing the gestures. They decided to put the DVD back in and have me sit on a couch nearby as Zach would watch the DVD. He would look at it and then me. 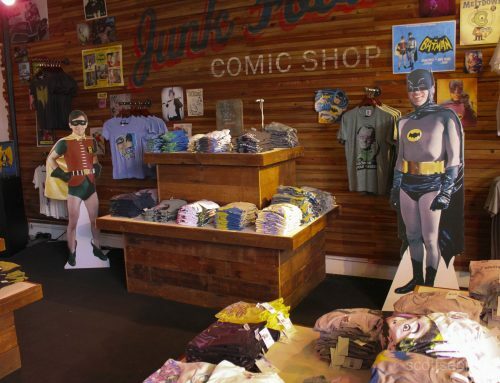 I would point out things like, “That’s the Batmobile…and that’s the Batcave…” Although he sat with his father, he gave me a high five and would shake my hand. We were making progress. Joel’s kids soon arrived although they ranged in ages 16 to 22. They were all surprised to see me in full costume. My sister Hope wanted to try and have some photos taken of Zach and me. Zach was fine as long as his Mommy held him. 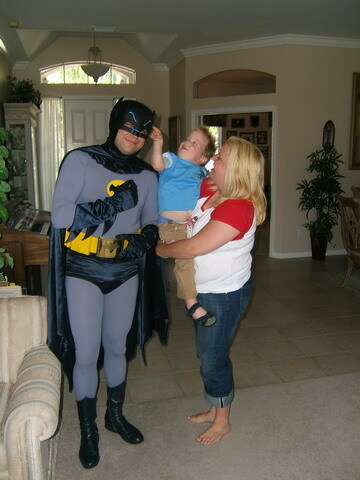 He even scratched my Bat-ear for me. One of Joel’s daughters, Cortney came up and said, “Hey! I want a picture with Batman!” She’s a spunky one. 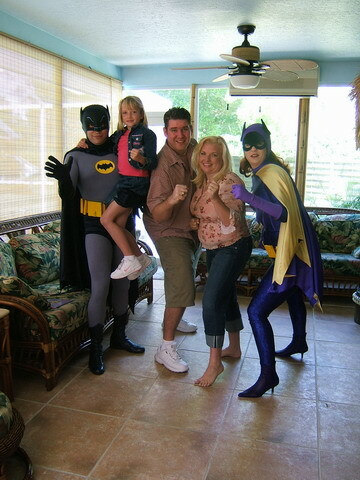 Vickie ran back to the room and brought out her Batgirl cowl and gloves for Cortney to wear. This was getting fun. Everybody started getting in on the act. My Dad posed with me as well. 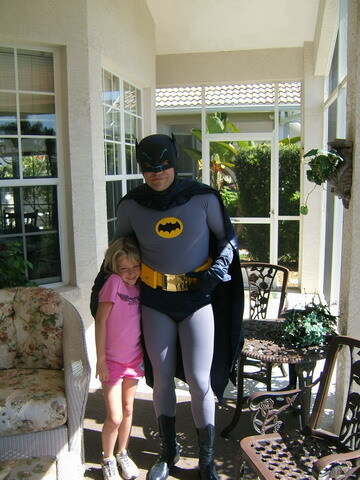 Rachelle wanted some pictures with me while she wore the cowl. 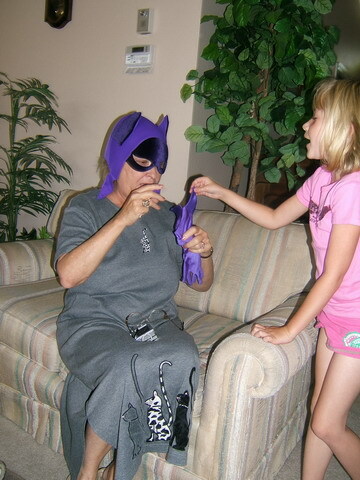 But my Mom pulled the biggest shocker when se started to put on the Batgirl cowl and gloves. I was blown away! 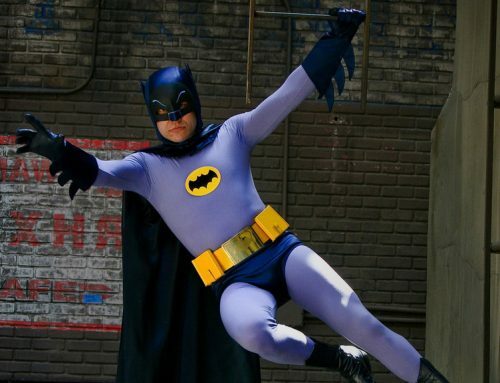 We all had a great bit of fun with it, but it was time for me to make my exit as Batman. I bid them a goodbye and once again Rachelle came over with one of those crushing hugs. While I was kneeling to hug her I looked over to Zach and asked him if he wanted to say goodbye. He walked directly over to me with a huge smile gave me a hug. My mission was now complete.